Possibly the most underrated member of the Roc-A-Fella team in their prime, Freeway may have been the most energetic artist on the label, as his at times high pitched but firm voice always seemed to match the awesome production he was blessed with. I recall his debut on Jay-Z’s “1-900 Hustler” song from the “Dynasty Roc La Familia” album and how he straight up killed that track. I also didn’t predict that he would end up as one of the mainstays on the label, even if it was brief. While he may not have achieved the same success as fellow (former) labelmates Beanie Sigel and to a lesser extent Memphis Bleek, Freeway could definitely hold his own, and his first two albums are very good proofs of that. Backed by the usually great production from Kanye West and Just Blaze, as well as contributions from the underrated Bink!, Ruggedness, and Black Key, Freeway was at his lyrical best on his debut. What most may not know/remember, is that when Freeway delivered either a heartfelt song or something highlighting key events from his past, you could feel the passion in his delivery (and that was the case on the song “Hear the Song”), and that same passion is another thing that’s missing from today’s hip hop scene. As usual with most debut albums, this remains his best and he proved to me he could hold down a solo album, even with the unnecessary Nelly collabo “On My Own”. Rating- I initially gave this one 4.5 stars, but now it sits comfortably at 4 stars. Sophomore jinx?? Not quite. Far from it if you ask me. He didn’t have Kanye and Just Blaze behind this one, but producers such as Bink!, Dame Grease, Jake One, Needlz, Don Cannon, & Cool & Dre did a damn good job behind the boards, and again, Freeway delivered lyrically. This album received less promotion and attention than his debut, but it’s still excellent and underrated. “I Cry” is another one of those songs where you can feel the passion in the delivery of his lyrics and it ends the album on a good note. Released in 2009, “Philadelphia Freeway 2” fell on largely deaf ears. I never checked it out, mainly because it was released on Sacramento, CA based label “Real Talk Entertainment”, and I don’t trust any release(s) from that label quite frankly. 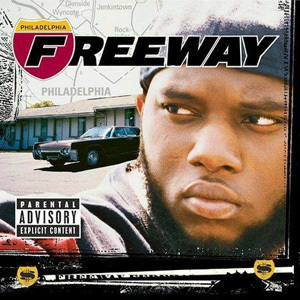 Freeway also did a collaboration album with producer Jake One, in the form of 2010’s “The Stimulus Package”, and it was a very good album (haven’t played it since, oddly enough, lol). Also in 2010, another collaboration album was released, this time with Beanie Sigel, titled “The Roc Boys”. While that idea would’ve been great in years past, the fact that it was released on siccness.net (another label whose releases I don’t trust) and it had NO buzz, I never bothered to check it out. Currently Freeway is part of Rhymesayers Entertainment (thankfully he didn’t sign with Young Money/Cash Money Records), with apparent plans to release “Diamond In The Ruff”, either this year or in 2013. If it’s released I’ll check it out, but in the meantime, as long as his first two albums and the project with Jake One are part of my collection, I’m satisfied.